How is Your Intellectual Empathy? Have you ever done that? Have you ever been so convinced of your own thinking that you refused to see another’s point of view? There is a name for this type of thinking: Lack of intellectual empathy. Intellectual empathy is having a consciousness of the need to imaginatively put oneself in the place of others in order to genuinely understand them. This requires the consciousness of our egocentric tendency to identify truth with our immediate perceptions of long-standing thought or belief. Michael Jinkins published an article in the Huffington Post about Intellectual Empathy. He tells a story of a professor who demonstrated outstanding intellectual empathy. You can access the article at link. 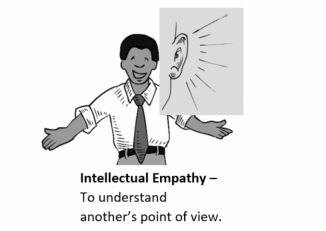 This concept of intellectual empathy made me very aware of something that I have been struggling with but couldn’t put a name to. Now that I have a name for it, I will be able to do something about it. Go into each situation mindful of your approach and thinking; if you believe it is lacking intellectual empathy, take note and change your mind-set to one of curiosity. Change your goal; it is not to be the expert – but to be the learner. What will you learn from this person/group? How will they look at the information in a way you haven’t? Challenge yourself to see every point of view and to look for new ways to see the information you already know. Diane is the author of the first-of-its-kind public mobile LearningApp to teach a softskills topic. It is a book disguised as classroom learning with the interaction of social media. The app teaches leaders the ins and outs of delegation. To preview or purchase the app, click on a link below.